Hi everyone. My name is Neven. I came to my furever home some years ago. I had a lot of medical issues that surfaced shortly after I arrived. My people got me right in to the doggie hospital. Not the best week of my young life. The nice doctor treated me for something she called Parvo. My people came to visit me everyday. I made a full recovery and became a family member. We moved to a new home recently with lots of room to run and explore. Do you know it is hard to stop on hardwood floors? I also have a big deck to lounge on. We go for walks and I love car rides. We have cars that have what I call "holes in the roof". Nothing better for a big beagle boy than having your face in the wind with a smile on your face. Although I was living the good life something was missing. I needed a four legged friend -my furever dad thought. He had an idea he told me. “Here Neven”, he said. “Look at this picture I found on Midwest Beagle Rescue website”. I said she looked like a little sister I could live with. We drove a long way on that rainy day to adopt my new sister, Pearl. Her foster mom must be a special person. She sent a big bag of her things with her that she would need at her new home. I have been teaching her the ropes around here. She was very cautious for the first few weeks but she is in full stride now. I had to learn what mom calls "share". I let her know that I would share toys, bed space, deck space but my food bowl was not negotiable. Recently we had a family meeting and it was determined that Pearl would now be known as Maggie. She must like the name as she responds well to it. 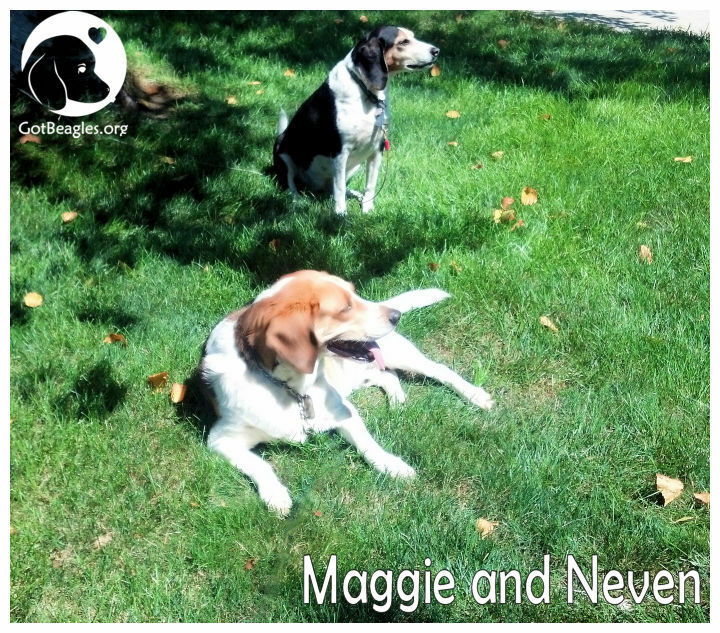 Maggie and I want to thank all our friends at Midwest Beagle Rescue for getting both of us to our furever home. We love you guys for giving us a second chance in life. We are both making the most of it and living our dreams. P.S. My little sister still has not gotten the hang of hardwood floors!